As Hong Kong marches ahead with its global smart city ambitions, smart manufacturing will play a huge role in advancing our economy. With Internet-of-Things, Sensing Technologies and Big Data all coming into play, AI and Robotics will completely redefine industries and businesses. 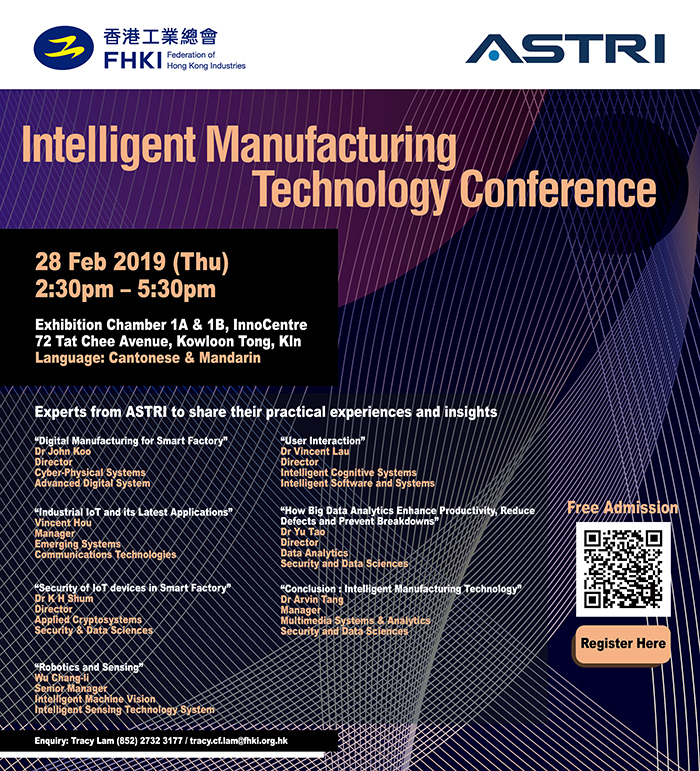 Learn the latest developments in Intelligent Manufacturing in the upcoming conference jointly organised by ASTRI and Federation of Hong Kong Industries (FHKI). With Industry experts, ecosystem leaders as well as ASTRI’s R&D specialists all set to share exciting insights, you can’t afford to miss out. The event will be conducted in Cantonese and Putonghua. Seats are limited; and it’s absolutely free. Don’t wait – register now! To register: Click here, insert ‘n/a’ under the ‘FHKI membership number’ tab on the registration form if you are not a FHKI member. Enquiries: Tracy Lam (Phone: 27323177; email: [email protected]) for more details.